This summer, I had the pleasure of getting to know and befriend Amanda Jean in person. We sewed next to each other for three days sharing all kinds of talk about families, funny kid stories, food, sewing, being practical & frugal Midwest gals, etc. During the course of conversation, we decided to do a swap, after I shared that I had a few unsatisfactory swaps (as in receiving nothing in return, TWICE) and therefore was a little gun-shy when it came to joining big swaps like Pillow Talk, Doll Quilt Swaps, etc. It is an original applique design I came up with for one of Victoria’s Block Gathers. Even the binding was a scrap of leftover binding I had saved, just the right size for this little rug! That’s a cute little card she stitched up, in that bottom left photo with my mug rug…very cute gift accessory. The pillow matches my Grandma’s bed perfectly, and looks pretty darned good with those aqua walls, too! Thanks a million, Amanda! You made my day-week-month!! A very satisfactory swap, indeed. And a friend I’m so glad to have met, truly. Oh Doris! I'm so happy for you! I too have been very unlucky in swaps, so I definitely shy away from them. Your one-on-one with Amanda Jean is perfect! What you made for her is so nice, well thought-out and gorgeous – I especially love the mug rug – and hers back to you is just the same. I couldn't be more pleased for both of you. It's the kind of holiday warmth that makes quilt-y friends so special. Blessings to you both. what a fun swap! Of course, you would get something fabulous from the amazing Amanda Jean. Good for you two for giving swapping another chance! Fun, fun swap! You both did such lovely things! p.s. Did I see “engagement” on the post about the quilt from Toni? 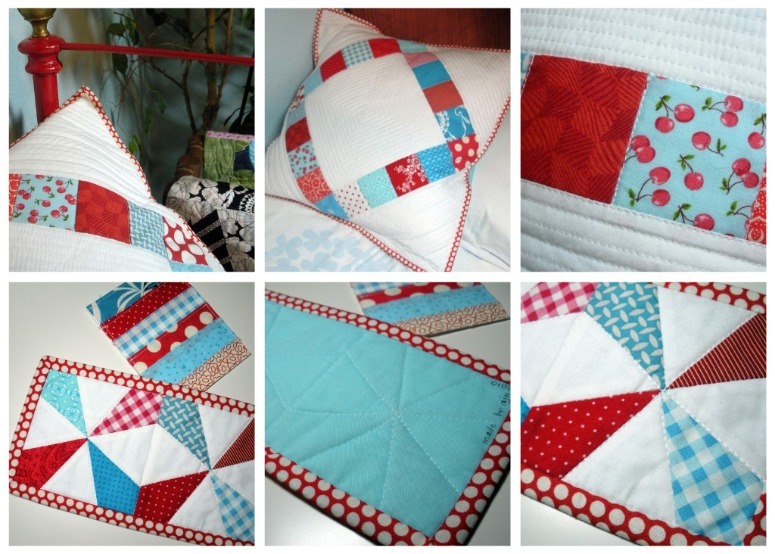 If so, double congrats…one for the lovely quilt and one for the engagement! I love Amanda Jean too and haven't even met her! LOVE all of what you two traded!!! Happy days. I read both of your posts. Lovely, talented, beautiful and thoughtful work from both of you. I could go on. Enjoy! 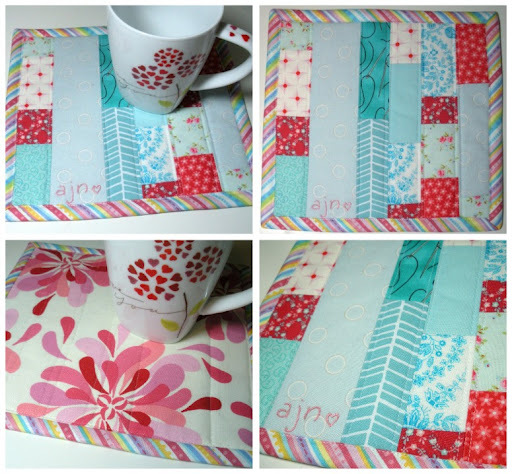 Both Pillows and mug rugs are fabulous! What a wonderful swap Doris! You are both winners! I have done the last two pillow swaps and had a wonderful time and they exceeded my expectations. But I have had other swaps that did not!